It seems that I am bit by the baking bug, especially cookies. I remember enjoying eating these biscuits that would be stored in big canisters in the bakeries when I was a child. I just loved their smell and the chewy texture of them in the centre. 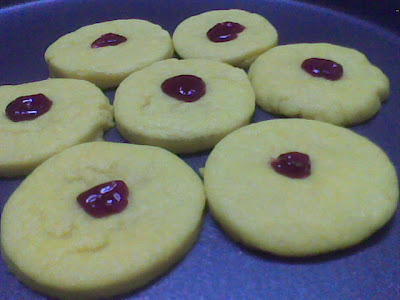 I baked these during the pongal holidays and it came out perfectly well. Pre heat the oven at 180 degrees. In a vessel take the butter and beat it well. Add the powdered sugar and beat it well till resembles a white cream. Add all purpose flour little by little and mix it well till it forms soft dough. Do not knead it tightly. Do not add water or milk. Flatten the dough on an even surface and cut the dough with the help of a cookie cutter in desired shapes. 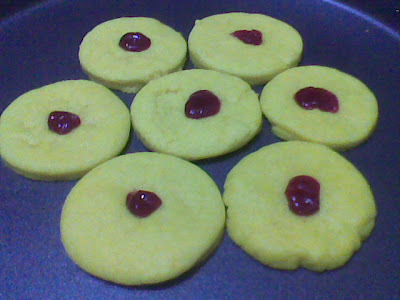 Beat the jam well and garnish it in the centre of the biscuit. You can also replace jam with tutti fruity. The biscuits that I made with the lemon zest had more flavor and aroma than when I replaced them with lemon essence. Store them in air tight containers and enjoy them during tea time. Bliss. Hope you have a great time enjoying them.